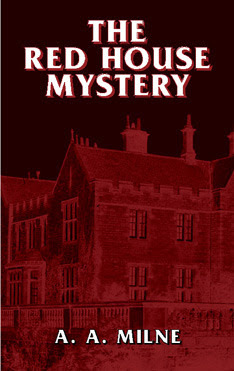 Excerpt from the public domain: Chapter One of The Red House Mystery by A.A. Milne. For the entire work go to Feedbooks. The Red House, stately mansion home of Mark Ablett, is filled with very proper guests when Mark's most improper brother returns from Australia. When the maid hears an argument in the study it isn't long before the brother dies... of a bullet between the eyes! Strangely, the study has been locked from the inside, and Mark Ablett is missing. Only an investigator with remarkable powers of observation could hope to resolve this mystery, and Antony Gillingham (with Bill Beverly at his side) is just the man. In the drowsy heat of the summer afternoon the Red House was taking its siesta. There was a lazy murmur of bees in the flower-borders, a gentle cooing of pigeons in the tops of the elms. From distant lawns came the whir of a mowing-machine, that most restful of all country sounds; making ease the sweeter in that it is taken while others are working. It was the hour when even those whose business it is to attend to the wants of others have a moment or two for themselves. In the housekeeper's room Audrey Stevens, the parlor maid, re-trimmed her best hat, and talked idly to her aunt, the cook and housekeeper of Mark Ablett's bachelor home. "For Joe?" said Mrs. Stevens placidly, her eye on the hat. Audrey nodded. She took a pin from her mouth, found a place in the hat for it, and said, "He likes a bit of pink." Alan Alexander Milne (1882-1956) was an English author, best known for his books about the teddy bear Winnie-the-Pooh and for various children's poems. He was born in London and attended Trinity College, Cambridge, where he edited and wrote for Granta, a student magazine. 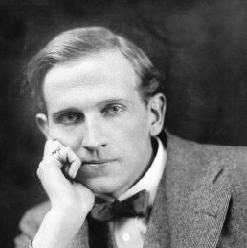 Milne's work came to the attention of the leading British humor magazine Punch, where Milne was to become a contributor and later an assistant editor. He and wife Dorothy were the parents of Christopher Robin Milne. "I don't say I mind a bit of pink myself," said her aunt. "Joe Turner isn't the only one." "It isn't everybody's color," said Audrey, holding the hat out at arm's length, and regarding it thoughtfully. "Stylish, isn't it?" "Oh, it'll suit you all right, and it would have suited me at your age. A bit too dressy for me now, though wearing better than some other people, I daresay. I was never the one to pretend to be what I wasn't. If I'm 55, I'm 55—that's what I say." "I was just giving that as an example," said Mrs. Stevens with great dignity. Audrey threaded a needle, held her hand out and looked at her nails critically for a moment, and then began to sew. "Funny thing that about Mr. Mark's brother. Fancy not seeing your brother for 15 years." She gave a self-conscious laugh and went on, "Wonder what I should do if I didn't see Joe for 15 years." "As I told you all this morning," said her aunt, "I've been here five years, and never heard of a brother. I could say that before everybody if I was going to die tomorrow. There's been no brother here while I've been here." "You could have knocked me down with a feather when he spoke about him at breakfast this morning. I didn't hear what went before, naturally, but they was all talking about the brother when I went in—now what was it I went in for—hot milk, was it, or toast?—well, he says, my brother is coming to see me this afternoon; I'm expecting him about three. “Yes, sir,” Auntie said quietly, but I was never so surprised in my life, not knowing he had a brother. “My brother from Australia,” said Mark Ablett. "Well, he may have been in Australia," said Auntie, “I can't say for that, not knowing the country; but what I do say is he's never been here. Not while I've been here, and that's five years." "Got into trouble, I suppose," said Audrey carelessly. "They were saying at breakfast he'd been a wild one. Debts. I'm glad Joe isn't like that. He's got 15 pounds in the post office savings bank. Did I tell you?" afternoon. The ringing of a bell brought Audrey to her feet—no longer Audrey, but now Stevens. She arranged her cap in front of the glass. sun, the open door of the Red House revealed a delightfully inviting hall, of which even the mere sight was cooling. It was a big low-roofed, oak-beamed place, with cream-washed walls and diamond-paned windows, blue-curtained. On the right and left were doors leading into other living-rooms, but on the side which faced you as you came in were windows again, looking on to a small grass court, and from open windows to open win- dows such air as there was played gently. The staircase went up in broad, low steps along the right-hand wall, and, turning to the left, led you along a gallery, which ran across the width of the hall, to your bedroom. That is, if you were going to stay the night. Mr. Robert Ablett's intentions in this matter were as yet unknown. As Audrey came across the hall she gave a little start as she saw Mr. Cayley suddenly, sitting unobtrusively in a seat beneath one of the front windows, reading. No reason why he shouldn't be there; certainly a much cooler place than the golf links on such a day; but somehow there was a deserted air about the house that afternoon, as if all the guests were outside, or—perhaps the wisest place of all—up in their bedrooms, sleeping. Cayley, the master's cousin, was a surprise; and, having given a little exclamation as she came suddenly upon him, she blushed, and said, "Oh, I beg your pardon, sir, I didn't see you at first," and he looked up from his book and smiled at her. An attractive smile it was on that big ugly face. Such a gentleman, Mr. Cayley, she thought to herself as she went on, and wondered what the master would do without him. If this brother, for instance, had to be bundled back to Australia, it was Mr. Cayley who would do most of the bundling. So this is Mr. Robert, said Audrey to herself, as she came in sight of the visitor. She told her aunt afterwards that she would have known him anywhere for Mr. Mark's brother, but she would have said that in any event. Actually she was surprised in the difference. Dapper Mark, with his neat pointed beard and his carefully curled moustache; with his quick-darting eyes, always moving from one to the other of any company he was in, to register one more smile to his credit when he had said a good thing, one more expectant look when he was only waiting his turn to say it; he was a very different man from this rough-looking, ill-dressed colonial, staring at her so loweringly. "I want to see Mr. Mark Ablett," he growled. It sounded almost like a threat. Audrey recovered herself and smiled reassuringly at him. She had a smile for everybody. "Yes, sir. He is expecting you, if you will come this way." "Oh! So you know who I am, eh?" "If you will come this way, sir," said Audrey primly. She went to the second door on the left, and opened it. was empty. She turned to the man behind her. "If you will sit down, sir, I will find the master. I know he's in, because he told me that you were coming this afternoon." He looked round the room. "What d'you call this place, eh?" "Yes,” she said, “The room where the master works, sir." "Works, eh? That's new. Didn't know he'd ever done a stroke of work in his life." "Where he writes, sir," said Audrey, with dignity. The fact that Mr. Mark wrote, though nobody knew what, was a matter of pride in the housekeeper's room. "Not well-dressed enough for the drawing-room, eh?" "I will tell the master you are here, sir," said Audrey decisively. She closed the door and left him there. Well! Here was something to tell auntie! Her mind was busy at once, going over all the things, which he had said to her and she had said to him. However, the immediate business was to find the master. She walked across the hall to the library, glanced in, came back a little uncertainly, and stood in front of Cayley. "If you please, sir," she said in a low, respectful voice, "can you tell me where the master is? Mr. Robert is here." "What?" said Cayley, looking up from his book. "Who?" "I don't know. Isn't he in the office? He went to the Temple after lunch. I don't think I've seen him since." "Thank you, sir. I will go up to the Temple." Cayley returned to his book. the back of the house, about 300 hundred yards away. Here Mark Ablett meditated sometimes before retiring to the "office" to put his thoughts upon paper. The thoughts were not of any great value; moreover, they were given off at the dinner table more often than they got on to paper, and got on to paper more often than they got into print. But that did not prevent the master of the Red House from being a little pained when a visitor treated the Temple carelessly, as if it had been erected for the ordinary purposes of flirtation and cigarette-smoking. There had been an occasion when two of his guests had been found playing fives in it. Mark had said nothing at the time, save to ask with a little less than his usual point—whether they couldn't find anywhere else for their game, but the offenders were never asked to The Red House again. Audrey walked slowly up to the Temple, looked in and walked slowly back. All that walk for nothing. Perhaps the master was upstairs in his room. She reflected on what Robert had said: "Not well-dressed enough for the drawing-room." Well, now, Auntie, would you like anyone in your drawing-room with a red handkerchief round his neck and great big dusty boots, and—listen any of the men shooting rabbits were better dressed. Well, one thing, she thought, Mr. Robert wasn't staying the night; he hadn't any luggage. Of course Mr. Mark could lend him things; he had clothes enough for six. She would have known him anywhere for his brother. She came into the house. As she passed the housekeeper's room on her way to the hall, the door opened suddenly, and a rather frightened face looked out. "Come in, Audrey," called Mrs. Stevens. "What's up?" said Audrey, looking in at the door. "Bangs and explosions and terrible things." Audrey looked at her aunt and then at Elsie. "Do you think he had a revolver with him?" she said in a hushed voice. Audrey replied, "That brother of his. From Australia. I said as soon as I set eyes on him that he was a bad lot. That's what I said, Elsie. Even before he spoke to me. Rude!" She turned to her aunt. "Well, I give you my word." "If you remember, Audrey, I always said there was no saying with anyone from Australia." Mrs. Stevens lay back in her chair, breathing rather rapidly. "I wouldn't go out of this room now, not if you paid me a hundred thousand pounds." "Oh, Mrs. Stevens!" said Elsie, who badly wanted five shillings for a new pair of shoes, "I wouldn't go as far as that, not myself, but—"
"There!" cried Mrs. Stevens, sitting up with a start. They listened anxiously, the two girls instinctively coming closer to the older woman's chair. A door was being shaken, kicked, rattled. Audrey and Elsie looked at each other with frightened eyes. They heard a man's voice, loud, angry. "Open the door!" it was shouting. "Open the door! I say, open the door!" was her door which was threatened. "Audrey! Elsie! Don't let him in!" "Damn it, open the door!" came the voice again. "We're all going to be murdered in our beds," the older woman quavered. Terrified, the two girls huddled closer, and with an arm round each, Mrs. Stevens sat there, waiting.